Michael Peretz (left), and Dr. David Peretz holding the 2011 Brass Ring Award presented by the IAAPA Awards Committee at the 2011 IAAPA Attractions Expo. 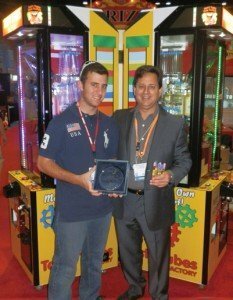 Laser Star Amusements was proud to be the recipient of the 2011 IAAPA Brass Ring Award for Best New Coin Operated/Redemption Game for its Tasty Tubes Factory. The device allows the player to make their own edible candy art in a tube. Players use the game’s joy stick to rotate a carousal to add up to eight different flavors into a dispensed tube. Once the tube is filled, the game lowers the tube back to the player. The game combines funny sound effects with flashing lights to make the experience truly interactive. For more information contact the company.